The Mockingbird: Metaphor for Evolution :: Grammar, style, and proofreading quizzes use sentences from literature. 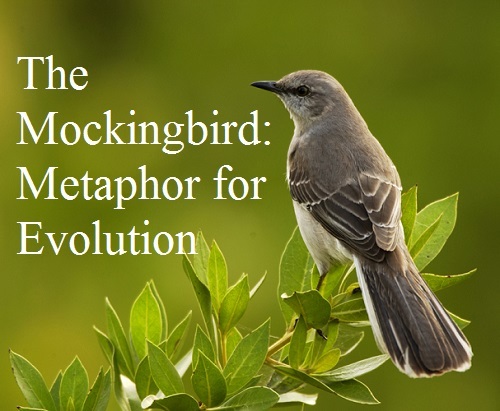 The Mockingbird: Metaphor for Evolution. Charles Darwin couldn’t figure out why mockingbirds in the Galapagos Islands differed on each island and on the South American mainland. Back in England a year after the voyage of the HMS Beagle in 1835, Darwin was going over his notes. His data contradicted accepted scientific doctrine that species could not change. Then, EUREKA! Darwin realized he was in new scientific territory. The mockingbird, along with Galapagos tortoises, were the proof that species evolved. In Harper Lee’s To Kill a Mockingbird, Atticus Finch warns his children not to kill a mockingbird. The songbird serves as a metaphor for innocence – the innocence of Tom Robinson and Boo Radley. In light of its scientific importance, the mockingbird expands the metaphor to symbolize evolution. Prejudice is not a permanent human trait. Change is possible, including moral and cultural change. People – even racists and bigots – can evolve.